Drivers should be ready to solve all kinds of problems. 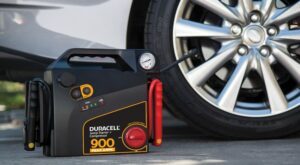 If you have an old car or your battery is not new and you experience start failures, then you should be ready to deal with it. Therefore, you need good equipment and that is right what STANLEY J5C09 is all about. 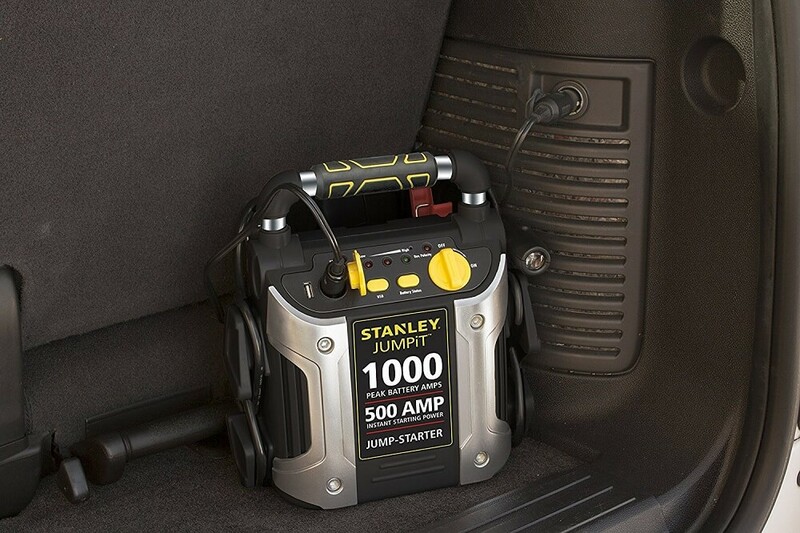 I have tried many different models from different manufacturers of jump starters and I decided that this device is one of the best jump starters I have ever had. It is powerful enough to start even a heavy-duty truck without any difficulties. 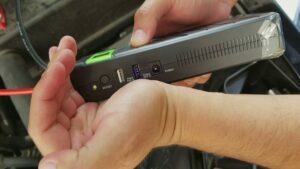 However, I also tried to jump start a motorcycle, a small car and a light-duty truck and the device always did its job well. It looks very massive and powerful. 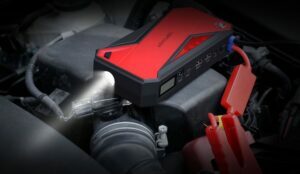 It is powerful and it is relatively heavy, but that is not an issue, considering the fact that it has a very powerful air compressor and high-capacity batteries that can start up many engines. It has a very good handle so you can take it wherever you need. Another important feature of this device is the LED light that can be rotated, so you can light up different spots without moving the whole device. Moreover, the LED light makes it possible to use it in dark areas during nights. 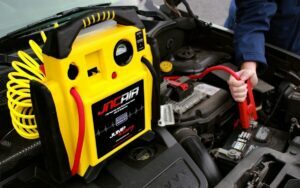 It is a multifunctional device and one of the additional components of this jump starter is an air compressor. 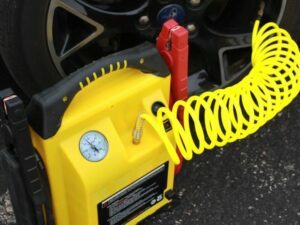 It is quite powerful and it can inflate a tire quick, even if it is a heavy-duty truck tire. The clamps are made of durable material, so the device will serve you long. 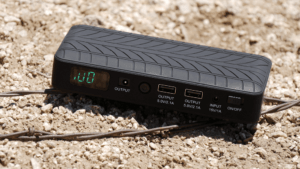 This device does not have a LCD display that could provide you with important information, but it has LED lights that show the charge level. It has an air compressor gauge on the back side. It has the necessary elements only. The device has two outputs – 12V and a USB port. A USB port is especially useful, since you can charge up different devices, like smartphones, tablets, etc. Of course, some people may say that it is too large and heavy, but nevertheless, it does what it should, plus it has a very powerful air compressor. The are no unnecessary elements. This kind of devices is super important for people who drive old cars or heavy-duty trucks or for those who leave cities and towns. There is nothing worse than staying in a middle of nowhere with your car broken. 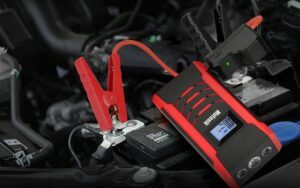 Even if you cannot jump start an engine, you can charge up your smartphone or any other device. This model combines high reliability with many functions and attractive design. The case is quite strong and it protects the internal parts of the device. You can be sure that you do not damage the device or a battery. The device is designed in accordance with modern safety regulations, so you have nothing to worry about. Plus, it has a special indicator that starts glowing if you connect the clamps in a wrong way. 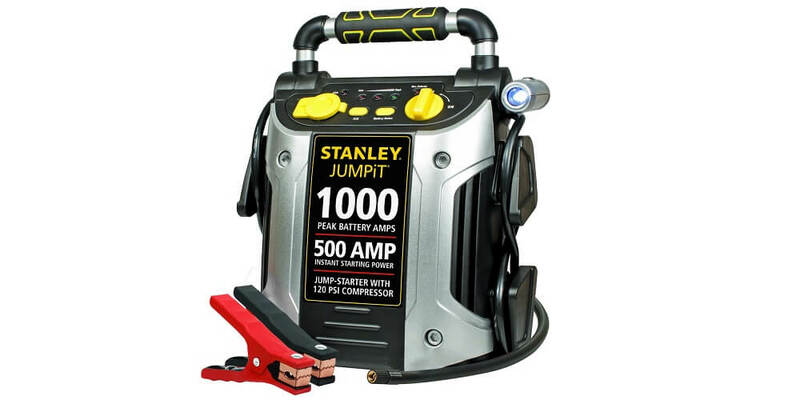 Attractive design is not as important as performance of a device and that is true not only for jump starters. 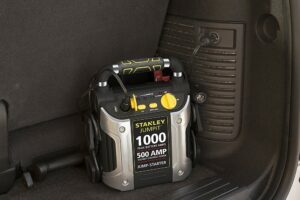 STANLEY J5C09 is a high-performance, reliable starter from a company that knows how to create good equipment. 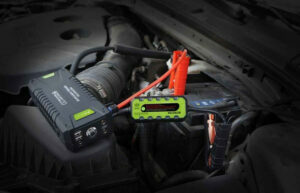 This device is powerful enough to start up a vehicle with a large engine. It has many functions that you may find very useful. 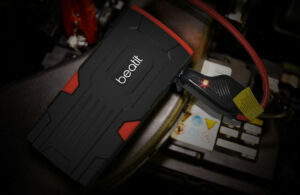 The peak power is 1000 amps. The instant power is 500 amps. It is enough to start up a wide range of vehicles. From small motorcycles to heavy-duty trucks without any problems. The highly-durable clamps are covered with special metal powder. It guarantees that the clamps will serve you long. A USB outlet. 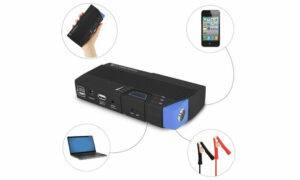 It is used to charge different kinds of devices, like tablets, smartphones or other gadgets. A LED light that can be rotated. An air compressor. 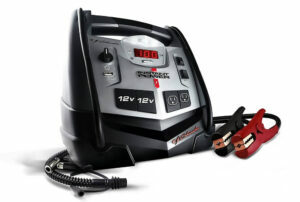 The power of the compressor is 120 PSI that is enough to inflate a tire or other equipment fast. 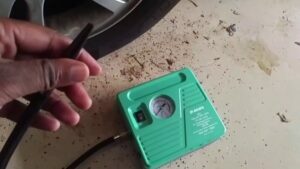 A gauge that shows the pressure of an air compressor. The nozzle that guarantees perfect sealing due to the special technology – SuperFit. An indicator that shows charge and power levels. An alarm that indicates if the clamps are connected wrong. A built-in charger. You do not need any special devices to charge the battery of this starter. Moreover, it has an extension cord. The weight is 18 pounds. The dimensions are 11.2 x 8 x 13.5 in. It is relatively heavy and large. No LCD display that can show more information. This is a perfect model for drivers who have light- or heavy-duty trucks. 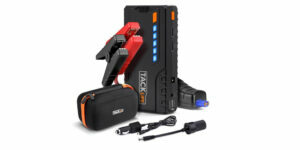 This jump starter is quite powerful and the battery capacity is high as well. It means that you do not need to recharge it often. 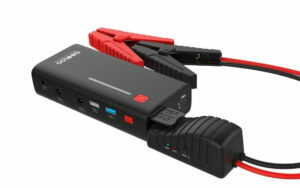 Moreover, it can be used to charge USB devices or other equipment that can be connected to a 12V outlet. 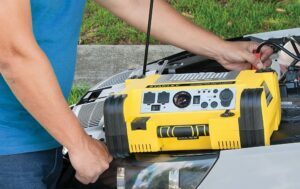 It also has an air compressor, which can inflate a tire very quickly. It is a very useful device for drivers, especially for those, who drive through a country. Verdict – should you buy the Stanley J5C09? This starter is a great option for people who have light- or heavy-duty trucks. It has helped me many times. 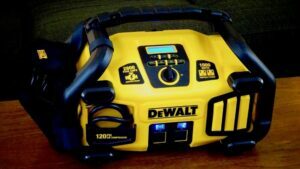 This device can start up even a large engine, but it also has many other useful functions, like an air compressor. 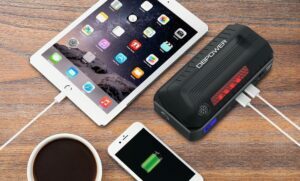 It can be also used to charge up different devices. Therefore, it combines high performance with a great number of functions. Some people may find it quite large and heavy, but the reason is that it has an air compressor. 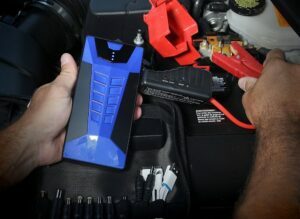 It is better to have one device that can jump start an engine and inflate a tire rather than having two separate devices that will take more space. Another disadvantage of this device may be the absence of a LCD display, but that is not a big deal, since LEDs can tell you the most important information and you do not need to know the rest. It has different alarms that will inform you if you do something wrong. This is a great solution from a professional company and I would like to recommend it to all drivers.